Ricardo Tamura sang “ReconditaArmonia” with radiant tone, a true lirico-spinto tenor with dramatic power and precision Since then, TAMURA has become a regular guest of the Met, singing parts such GUSTAVO, DON CARLO, TURIDDU or CANIO. Born in Brasil, Ricardo Tamura first studied geology at the Sao Paulo University. Having completed this studies , he began studying singing at the Julliard School in New York on the recommendation of Licia Albanese. He completed his musical education at the Accademia Chigiana in Siena and the Accademia Verdiana in Busseto with Carlo Bergonzi. 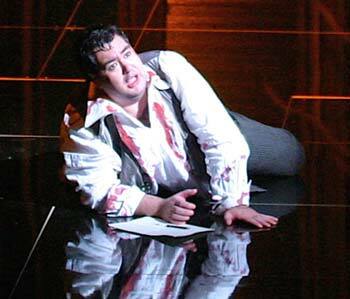 His first engagement brought him to the Zurich Opera House, where he was a member of the International Opera Studio. Since then, the artist, which is hailed by the press as being “absolutely secure in the high registers”, has sung more then 50 parts in operas, operettas and musicals. Ricardfo Tamura is much dedicated to the Italian repertoire, especially the works of Giuseppe Verdi and Giacomo Puccini. His repertoire includes such roles as DON CARLO sung at the Nuremburg State Theatre, the German Opera at the Rhine Dusseldorf/Duisburg, RODOLFO, PINKERTON, CAVARADOSSI, CALAF , which he sang lately at the Vienna Popular Opera and at the Erfurt Cathedral Festival, DES GRIEUX and RICCARDO or RADAMES, which he also sang at the Arena di Verona. One of his most interpreted roles is CANIO, which he performed a.o. at the Schwerin Castle Festival and under Alexander Soddy in Klagenfurt. He succeeded with OTELLO at the Kassel State Theatre and at the Hannover State Theatre. Here, he also portrayed CALAF, BACCHUS, TURIDDU and CANIO . But Ricardo Tamura is also at ease with the French and the German repertoire. He sang BACCHUS a.o. at the Welsh National Opera Cardiff and the Nuremburg State Opera and in 2013 he made his successful debut as TANNHÄUSER. His first radio transmission took place in 2005, as he sung with the WDR Orchestra (West German Radio Orchestra) in Alfredo Keil’s Portugese National Opera ‘Serrana’ at the Dresden Semper Opera. In 2006, his first CD recording – a total recording of Hans Werner Henze’s ‘Das Wundertheater’ – was published. Ricardo Tamura’s interpretation of Chafalla on this record was particularly praised by the composer. The most particular highlights in the same year included a concert on the occasion of the 150 anniversary of Puccini with the Nagoya Philharmonic Orchestra in Japan and an open-air concert for a 60.000 audience at the Luitpoldhain in Nuremberg. In 2016 Ricardo Tamura sang for the first time CALAF at the Metropolitan Opera New York under Fabio Luisi anf he made his debut as DES GRIEUX in ‘Manon Lescaut’ at the Hannover State Opera. At the opera houses of Pisa and Goldoni, he also was DES GRIEUX and he sang concerts in the Meisterhalle in Nuremburg and in Tokyo. Lately,he enjoyed great successes as CALAF at the Leipzig Opera House, as DON JOSÉ in Nuremburg and as CAVARADOSSI and DON JOSÉ in Koblenz. In the season 2018/19 he is CAVARADOSSI in ‘Tosca’ and he makes his debut as RIENZI. Ricardo Tamura sings both Turiddu and Canio beatifully timbred, with lots of melodiousness, power and secure high registers. 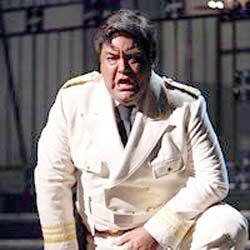 Ricardo Tamura sings both Turiddu and Canio with a beautiful, powerful tenor voice and magnificant high notes. 'At the beginning of the first act, Ricardo Tamura sang “Recondita Armonia” with radiant tone, a true lirico-spinto tenor with dramatic power and precision ending with a resounding “Tosca, sei tu.” Tamura sang passionately in the jealousy duet “Qual occhio al mondo” and he and his Tosca, the acclaimed American soprano Sondra Radvanovsky had very good chemistry onstage. In the second act Tamura’s long held triumphant cries of “Vittoria, vittoria” brilliantly soared through the house. He shows remarkable breath control and mastery of the Italian style. The final act offered us a ravishingly sung “E luceven le stelle” with caressing style, soaring power and exquisite dimuendos, earning Tamura a prolonged ovation.